Borage (Borago Officinalis) - May the welling up of sorrow and depression be transmuted as they pass through your heart and higher heart chakras then, flowing effortlessly, pour forth from your throat chakra as heart-centered conscious speech. I AM the alchemy of transforming sorrow and depression into caring conscious speech. Borage is a common garden herb with star-shaped blue flowers that are great in salads. Its healing properties come primarily from the presence of essential fatty acids, the most important of which is GLA, an omega-6 fatty acid found in borage seed oil. Borage oil is taken to calm inflammatory conditions such as arthritis or eczema, for premenstrual symptoms, for diabetes or the prevention of heart disease. Being self-centered, rigid and focused on sorrow, bitterness and blame. This can lead to depression that makes you unable to feel and genuinely express your true feelings. Transforms deep seated sorrow, bitterness and blame as they pass through the heart and higher heart chakras, then flowing effortlessly, pours forth from your throat chakra as heart-centered conscious speech imbued with Divine power. Borage Flower Essence shifts a tendency of being self-focused toward caring for other people who are also experiencing difficulties. 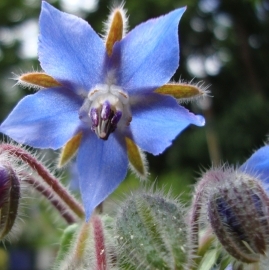 Borage Flower Essence was made by the no-pick method of working directly with the plant spirit. While the essence was being made a matrix of amber, blue calcite, blue kyanite, charoite, drusy quartz, icosahedron, kunzite, lapis, malachite, pink sapphire, quartz points, rose quartz, sodalite and watermelon tourmaline crystals were placed among the plants with the mother bottles. The sun acts as a transformer to step down spiritual energies from higher dimensions. While the essence was being made, Amber acted as a lens to receive and focus sunlight for this purpose. Amber aligns the subtle bodies with the physical bodies, transmutes negative energy into positive energy, and emits a sunny and soothing energy that calms and enlivens the disposition. Blue calcite, a premier throat chakra stone, soothes nerves, decreases anxiety, clears negative emotions, and facilitates clear calm communication. Blue kyanite creates “bridges” over gaps created by emotional energy blockages that act like skips in a CD track. These bridges create new pathways of energy flow that shift your perception of the world. Charoite assists with integrating heart chakra and higher mental energies while transmuting victimization and other negative emotions. It enhances courage. Drusy quartz crystals help to energize and stabilize your subtle bodies. Icosahedron cut quartz has 20 (5X4) equilateral sides. It is a bridge between the 5th Dimension - the entry into the unified Spiritual realms - and the 4 cardinal directions (N, S, E, W) on Earth. Kunzite opens your heart to self-love and love for everyone and everything. Encourages you to listen and follow the silent intuitions and urgings of your heart. Releases stress and supports the parasympathetic nervous system. Lapis brings truthfulness, openness, inner power, intuition, and spiritual love. It is associated with the throat and 3rd eye chakras. Malachite burns through emotional fog, and helps you use your power in a constructive creative manner. It restores strength and vitality by clearing and stimulating the flow of life force in the physical, emotional, mental and spiritual subtle bodies. Pink sapphire opens your heart to the joy of interacting with kindness, forgiveness and love. Encourages vulnerability with appropriate boundaries. Quartz points open and clear all chakras and energy pathways, and clear and expand the energy fields. Quartz points and drusy quartz crystals defined the boundary of the energy field for making the Borage Flower Essence. Rose quartz encourages gentleness, emotional healing, and uniting with the Divine; it shifts your body from a stress-based physiology to a higher frequency Love-based physiology. Sodalite helps you shift from experiencing your world through worry, anxiety and stress to envisioning your life from a more serene perspective. Watermelon Tourmaline resolves anger and resentment and creates a powerful healing field of love and compassion. It calms the mind and emotions and aligns you with joy and love. The actions of the crystals inform the way this flower essence seats into the body/mind. While the Borage Flower Essence was being made imprints of blue jay feathers, rattle, and spirit song coming through Diana’s voice were infused into the essence.